The biggest and best FREE party of the summer is just around the corner. 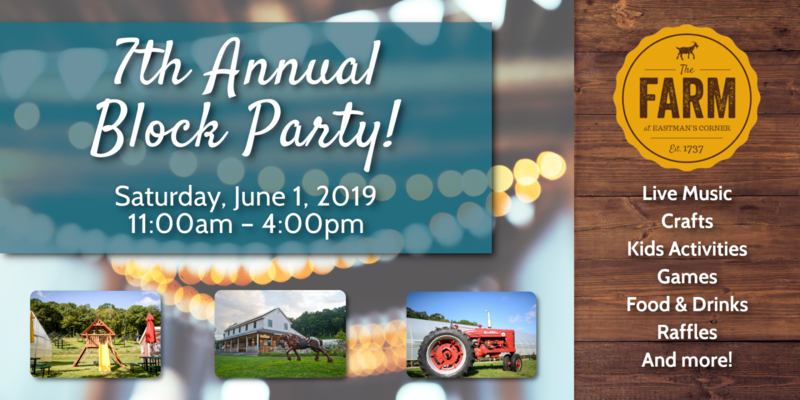 Join us on Saturday, June 1, 2019 at the Farm at Eastman’s Corner to celebrate our customers and the wonderful community we are a part of. We will have live music, crafts, plenty of kids activities, games, food & drinks, raffles, and much more! This annual celebration, now in its 7th year, is a great time for the whole family! Our Block Party is a great time where our friends and neighbors come together to enjoy all that Eastman’s Corner has to offer. We will have our very own Eastman’s Corner Food Truck on hand cooking and serving up delicious lunch options available for purchase, including burgers and dogs, as well as some of our farm favorites (including vegetarian and vegan options). There is no charge for admission and everyone is welcome!